BT's radio favours a purely modern look. 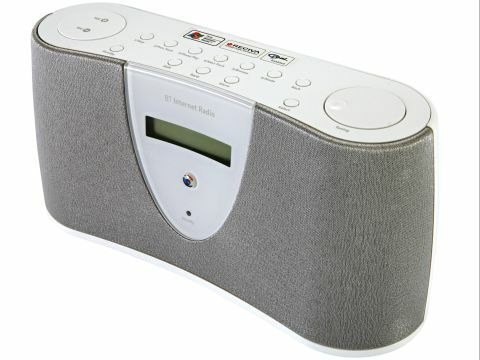 With its trendy white iPod meets silver acoustic cloth design, BT carries its design intentions off well. Of course, radios aren't things to be looked at, they're to be listened to. When it comes to sound quality, the BT musters a little more bass, slightly crisper treble and makes music sound a smidgen better than its rivals. When it comes to speech, you'll need the ears of a bat to detect the difference. And then there's operation. Setting up security - such as WEP, WPA and MAC address configurations - is initially a fiddle, but afterwards picking stations or grazing the Internet airwaves is easy. The BT radio also works as a media player, playing music files stored on your PC. There are two ways in which this can be achieved. First, you can set up Windows to allow the radio to access your PC's audio files via Windows Shares. This uses a feature present in both Windows 2000 and XP and is best suited to compressed music such as MP3s or WMA files. However, if instead large and uncompressed music files, such as WAVs, comprise the bulk of your music collection then it's better to use a Universal Plug and Play (UPnP) server. We were impressed with the clear way in which BT's manual dealt with all of these configuration topics.